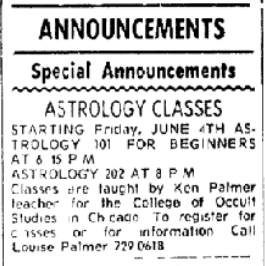 I've only been able to find minimal information regarding the College of Occult Studies. The most that I currently know is this: it was around in the late 1960s and early 1970s and was located at 410 S Michigan Avenue, later to relocate to 505 N Michigan. Does anyone else have more information?